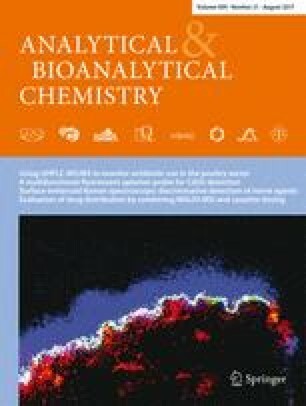 In this study, we have successfully synthesized a forchlorfenuron (CPPU)-imprinted polymer in dimethyl sulfoxide by molecular imprinting technique. In the molecular imprinting, β-cyclodextrin was used as the monomer with 1,6-hexamethylene diisocyanate (HMDI) as the cross-linking agent that formed a complex with forchlorfenuron by inclusion interactions. The adsorption equilibrium was attained in approximately 30 min and the maximum binding capacity was 26.79 mg/g, which indicated that the adsorption kinetics was relatively fast. The results of adsorption and selectivity experiments have shown that the imprinted polymer was able to bind forchlorfenuron specifically and reversibly. The specific recognition of the imprinted polymer for forchlorfenuron resulted from the cooperative effects of inclusion interaction and hydrophobic interaction. This imprinted polymer was also used to accurately determine forchlorfenuron residue in real fruit samples. In the standard spiked strawberry sample, the adsorption recoveries for forchlorfenuron were as high as 90.3, 84.5, and 90.8%, respectively. The binding specificity of the imprinted polymer for forchlorfenuron resulted from the imprinting effect. Therefore, as a reusable material possessing high affinity and selectivity, the imprinted polymer is promising in application to detect pesticide residues in fruit samples. In addition, because β-cyclodextrin is water soluble and can include neutral compounds, this molecularly imprinted polymer can be used to recognize pesticides in aqueous solutions. This work was supported by the National Program for Quality and Safety Risk Assessment of Agricultural Products of China (GJFP2015002, GJFP2016003) and the Agricultural Science and Technology Innovation Program of Chinese Academy of Agricultural Sciences (CAAS-ASTIP).